Grant is an an all round creative filmmaker and story teller, he believes in a holistic approach to film and his background in design provides a unique styling and approach. Having studied architecture and worked in design Grant progressed into film and has now built up a vast portfolio of work. Grant’s primary focus is a director having had his work played at festivals worldwide and having won a number of awards and competitions. 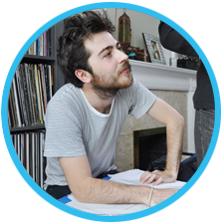 Grant has worked in both the corporate and creative world of film with work with clients that include Unilever, Wall’s, LG electronics, Legoland Windsor, Radio 1 DJ Phil Taggart and Kinder Bueno. Having recently left a role as a creative director recently Grant has a wealth of experience running projects of all shapes and sizes.